Traditional industries are being disrupted by the speed and efficiencies provided by robotic solutions and artificial intelligence – and so is surveying and civil engineering. Aerial mapping is lately gaining popularity, and allows surveyors and engineers to evaluate more job sites within their critical planning and acquisition schedules and speed up the design phase of every construction project. At AirWorks we focus on developing software that converts aerial images and models fully autonomously into computer aided design (CAD) files and drawings – but the start of every successful aerial surveying project is accurate aerial data. Over the past month, we’ve been working with many of our clients and are excited to share the main lessons learned on creating accurate aerial site plans and surveys. How did we get here and why now? First of all, aerial mapping is not new. The concept called photogrammetry has been used throughout the 20th century and basically consisted of any type of aircraft equipped with a high resolution, high speed camera flying at low altitudes to create topographic maps from the resulting overlapping images. What changed is the availability of affordable and high performing UAVs which have much easier, or even autonomous to operate safely. With a $2,000 commercially available UAV it is now possible to obtain a map at a ground resolution of 1-2cm, while a high performance aircraft camera that often comes with a price tag of $1M+ only gets us a ground resolution of around 5cm. This has been one of the drivers of the rise aerial mapping or even aerial surveying. The second driver is the availability of RTK (Real-time kinematic) GPS, or high accuracy GPS stations. RTK became popular in the early 1990s and has since then been proven as a very efficient tool for surveying and engineering professionals to obtain cm-level precision of coordinates. Before the availability of RTK-GPS, a surveying crew would have to tie into a known coordinate provided by the state, and triangulate the location of every point using expensive and more complex surveying equipment. RTK GPS has made it very simple to obtain coordinates for ground control points which are essential to determine and validate the accuracy of the aerial survey. 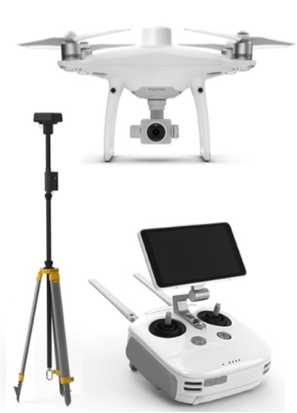 In order to complete an aerial survey, a company will need to purchase a UAV with at least 20MP camera. The DJI Phantom 4 Pro has been proven as the work horse for many aerial mapping companies, but there are plenty of alternatives on the market. There are also high performance UAVs available with even higher resolution cameras and or integrated RTK GPS but a 20MP camera already allows for accuracies of around 1-2 cm. We do recommend to purchase a set of extra batteries, multiple memory cards as well as a secondary charging source for your batteries. Nothing will set you back more than running out of batteries throughout the middle of the project. 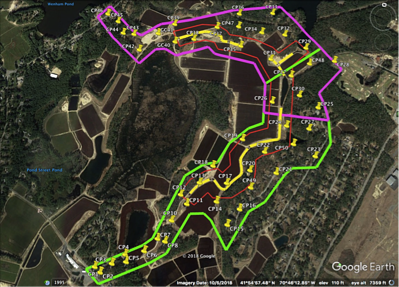 The most important part of your aerial survey is your RTK GPS station. The most common providers are Leica, Trimble and Carlson which all offer solutions that deliver 1-2cm absolute position accuracy, horizontally and vertically. Recently the company Propeller has launched their product AeroPoints which offers a cost-effective solution for companies to obtain ground control markers with integrated RTK GPS chips. When deciding on a provider, make sure that your provider offers GNSS RTK networks in your project area. Furthermore, you will have to get a set of at least 20 ground control points (Contact us here to ask for a set of AirWorks ground targets), surveying nails to secure the targets in place as well as safety equipment suitable for your site environment. Ground control has been discussed in many publications, and in summary it is the concept of tying your aerial models into known coordinates on the ground. This process allows an aerial model to achieve industry grade accuracies of around 1-2 cm. Furthermore, by using ground control points, a part of the points can be used for validating accuracies of the project. To achieve that, around half of the ground control points should not be used to calibrate the images. The other half can later be used to compare the known location of the control point with the calculated position of the same ground target identified in the model. If the points are distributed in a random manner, this method provides with a very objective indication of the accuracy of an aerial surveying project. This functionality is available in most common UAV photogrammetry solutions such as Pix4D, DroneDeploy or ContextCapture. At AirWorks we’ve helped many engineering and surveying companies establish robust aerial mapping programs within their teams. Furthermore, we provide the most efficient solution in converting your aerial images and models into a fully detailed civil engineering drawing of your construction site, including topography and existing conditions. Our autonomous software will convert any dataset generated through aerial images autonomously into a CAD drawing. The early stage prototype is shown here, and we are looking to release the first software version later in 2019. The efficiency, speed and accuracy of aerial mapping will soon make an aerial survey one of the first step of any new development or redevelopment project. This can lead to better data for civil engineers and land developers to take critical decisions early on in every development project, but also speed up design phase of the project. 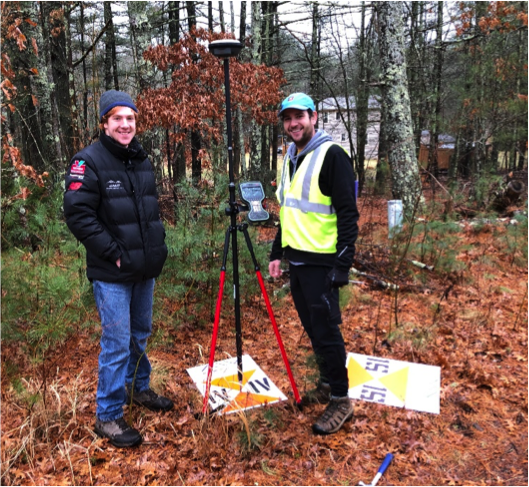 The data gathered through aerial surveying can later be supplemented by the surveyors with an on-the ground survey to validate the aerial mapping results, obtain a boundary survey and obtain the locations of below ground utilities – all required for your permitting process. AirWorks can help with data processing, and we look forward to support the surveying industry with software and processes that allow your company to integrate aerial mapping. Contact us to learn more. Our patented automated processing software allows us to deliver a final product to you within days of capturing the data, rather than weeks. 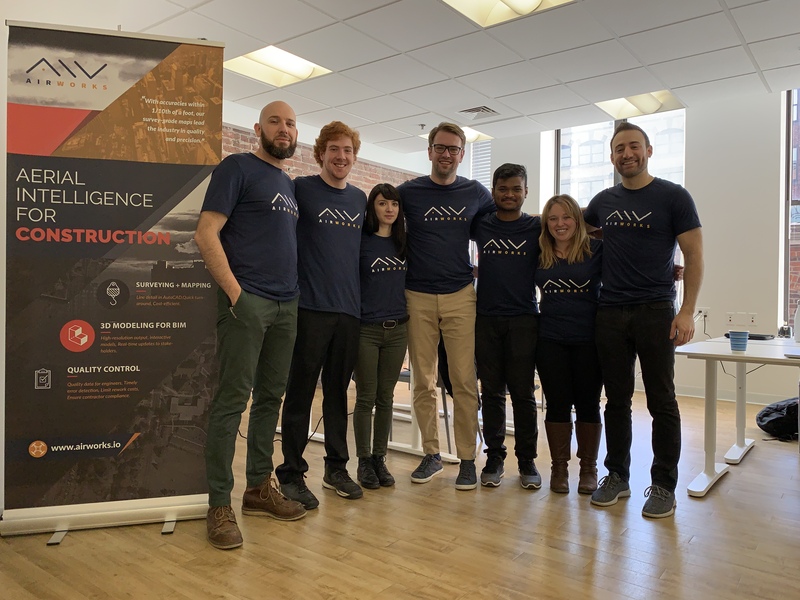 AirWorks provides aerial intelligence for the construction industry, using AI-powered software that autonomously converts 2D and 3D aerial data into CAD models.